The Last Green Valley, Inc. (TLGV) has awarded $15,000 in grants to six local organizations to preserve, protect, interpret, promote or market historic and cultural resources. Since TLGV began awarding historic and cultural grants in 2003, more than $1 million has been disseminated to local nonprofits and towns in the National Heritage Corridor. For many organizations, the funding is the necessary step toward completion of their projects. TLGV awards grants based on a competitive application process. Every project is vetted and evaluated for its potential benefit to the region. Every successful grant must be matched 1:1 by cash or in-kind contributions. The Eastford Historical Society was awarded $2,185 to preserve an original 1868 map, create a digital image, a preservation master and create a reproduction for display and handling by researchers. The map, “Map of Mill Properties belonging to Joseph B. Latham,” depicts the extensive holdings in the center of Phoenixville, a section of Eastford, in intricate detail. The map was an integral resource for Old Sturbridge Village when it conducted research in Phoenixville in the early 1980s. The Lisbon Trails Committee was awarded $2,060 as part of the ongoing restoration work at Historic Burnham Tavern. The trails committee proposes to design signage for the property and further develop the trail system on the property, including trail mapping and signage with appropriate heritage information regarding the property. The Thompson Historical Society was awarded $1,680 for the purchase of equipment to aid in iongoing digitization of its extensive historical collections. The project allows the historical society to preserve its physical documents while creating an efficient and effective inventory and catalog of historical information. Thompson Together was awarded $3,075 for the restoration of seven of Thompson’s historic cemeteries. The cemeteries – Carpenter, Joslin, Porter, Bates, Jacobs, Fabyan and Dike – will be assessed and plans for restoration at each developed. The work will include general maintenance to the cemetery grounds and the resetting and repair of tombstones. 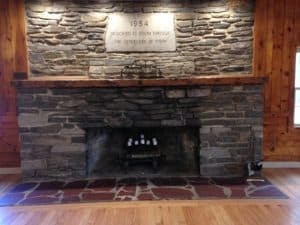 The Windham 4-H Foundation was awarded $2,000 for the repair of a historic fireplace and chimney in the main lodge of the Pomfret Center Camp. The 40-foot chimney serves fireplaces on both floors of the lodge and was completed in 1955 by local masons, the Wilcox brothers. The need for flue, ventilation and other repairs means the fireplaces have not been used recently for 4-H traditions dating back to the start of the camp. TLGV funding will join funding from the CT Trust for Historic Preservation and camp funding to complete the project.